Wild bergamot is very attractive to bees, butterflies and some birds. This aromatic plant is a perennial that grows from creeping rhizomes. This plant was extensively used by many Native Americans including, (but not limited to) the Menominee, the Ojibwa, and the Winnebago. It was used most commonly to cure colds by being made into a tea. 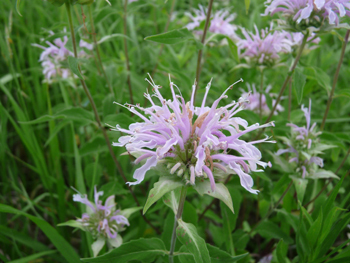 Monarda didyma (red bee balm) is also known as Oswego tea, not Monarda fistulosa (wild bee balm). Distinguishing Features: Beautiful shaggy lavender (sometimes pink) flowers distinguish this plant from many others. Related to thyme this plant much prefers dry, sunny locations as it can quickly develop mildew in overly moist conditions. This is a drought-resistant edible plant and it is dotted with glands that secrete aromatic oils. Wild bee balm’s closest cousin is Monarda didyma which is red and is common in cultivated gardens. Flowers: The lavender-coloured round-shaped flowers are fragrant. Flowers begin to bloom in the centre of the flower head and bloom toward the periphery. The corolla divides into a tubular upper lip with projecting stamens, and three slender lower lips that function as landing pads for visiting insects. The blooming period occurs mid-summer and lasts about one month. Depending on location, this flower can be pink. Fields of Nutrition has medicinal benefits and vitamin/mineral content of Wild Bee Balm. Leaves: Opposite leaves are broadly lanceolate to ovate and can vary in colour from light green to dark green (sometimes with red or yellow tints) depending on environmental conditions. Serrated margin leaves are hairless and can grow up to 10 cm long and 5 cm in width. They emit an oregano-like scent. 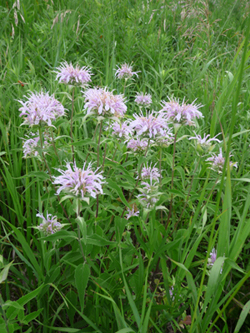 Height: Wild bee balm grows between 30 and 70 cm tall. Habitat: Wild bergamot habitats include moist to slightly dry soil but it prefers sunny, dry locations. It tends to thrive in thickets, borders of limestone glades, as well as in fields. It can grow in woodland areas but not in abundance. The rhizomes are able to survive earth moving operations and can send new growth in unexpected areas. Edible parts: Leaves and flowers. 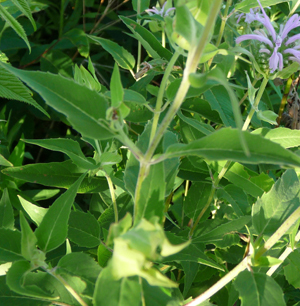 The leaves of wild bee balm are edible raw or cooked. They are also used as a flavoring in salads and cooked foods. The flowers make an attractive edible garnish in salads. Fresh or dried flowers and (or) leaves can be brewed into an aromatic tea. Similar plants: Red Bee Balm, Thyme.